Inflammation is a natural part of the body’s immune response, a cascade triggered to protect the body and maintain normal tissue repair. This physiological response is part of the innate immune or non-specific immune system, a first line of defense comprising the cells and mechanisms that defend against unwanted organisms in a non-specific manner. The inflammatory cascade is mediated by eicosanoids, which have been shown to balance inflammation and immunemodulating cytokines. Traumeric provides a blend of nutrients which support a healthy inflammatory cycle by balancing eicosanoid and cytokine metabolism and inhibiting the activities and synthesis of a wide variety of compounds implicated in pain and inflammation. 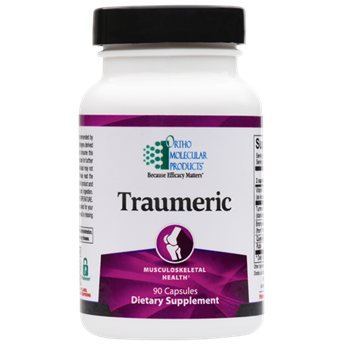 Traumeric is formulated specifically to support healthy inflammatory balance and musculoskeletal health. Traumeric includes key ingredient turmeric, standardized to include 95% of curcumin. Traumeric also includes the pineapple enzyme bromelain, as well as flavonoids quercetin and rutin for full-spectrum, high-intensity support to maintain a balanced cycle of inflammation.